“Get active, protect our wild places and work for global climate issues,” Meadow Valley’s Darrel Jury told a packed audience at a recent showing of the Teton Gravity Research film “Ode to Muir” held at the Town Hall Theatre in downtown Quincy. 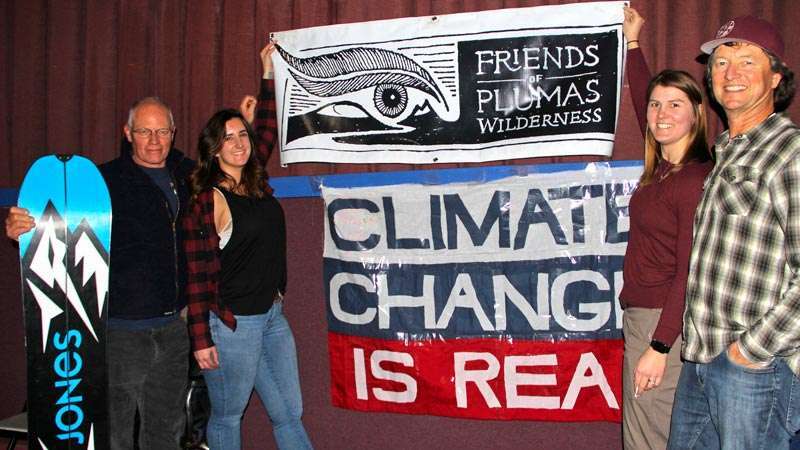 Hosted by the local nonprofit Friends of Plumas Wilderness (FPW), for which Jury serves as president, in partnership with Plumas Arts, the event was designed to promote public interest in the Plumas National Forest Service’s current draft winter travel plan. Comments on the draft plan were accepted through Jan. 24 and in partnership with FPW, the Winter Wildlands Alliance encouraged protection of terrain east of Bucks Lake Wilderness, the Bucks Creek Loop Trail, the Historic Lost Sierra Ski Traverse Route and the backcountry ski zone on Thompson Peak by Susanville. The two organizations urged the Forest Service to include specific amendments to protect proposed Middle Feather, Bucks Creek, Chips, Grizzly and Adams Peak Wilderness Areas, Lakes Basin Snowshoe and Ski Trails and Little Jamison Basin. They also requested the Forest Service to stop grooming on 24N33 to help prevent over-snow-vehicle trespassing into the Bucks Lake Wilderness. Jury spoke about the pressing need to advocate for quiet places in wilderness areas where “human-powered” recreation can be enjoyed now and for generations to come. The breathtaking film opened with professional snowboarder and founder of Protect Our Winters (POW) Jeremy Jones taking viewers on an epic backcountry winter expedition through the John Muir Wilderness. With Jones was a noted Sierra guide, two camera crewmembers and two-time Olympian Elena Hight. The film captured the essence of being in big wilderness while revealing the effects that climate change has had on these higher elevations. In the hour-long movie, Jones introduces distinguished preservationist John Muir to a new generation of wilderness advocates by sharing similar revelations the two activists experienced a century apart in the same wild places. “The older I get, the older I like my snow,” said Jones, narrating the adventure and skiing off on a steep descent down a blizzard-white face of granite 11,000 feet up in the Western Sierra. The famed snowboarder and his companions hiked to, and skied down from, heights up to 14,000 feet over the nine-day adventure. Jones also talked about the opportunities that climate challenges present here at home and around the world and discussed California’s snow- and water-capture system. Jones’ Protect Our Winters organization is the leading international climate advocacy group for the winter sports community. Jury said POW is building a movement to fight climate change. “If you are a passionate outdoor person, you will want to learn from POW’s athlete ambassadors who offer insights on how you can become an effective climate advocate,” he explained. Since 1975, Friends of Plumas Wilderness has grown as a local grassroots conservation group dedicated to studying, exploring and maintaining the integrity of natural ecosystems where the Sierra Nevada meets the Cascades. The “Ode to Muir” film program was supported by several sponsors including the local Quintopia Brewing Co., Quincy Natural Foods, Plumas Audubon Society, REI Co-Op, New Clairvaux Vineyards and Jones Snowboards, which provided a grand-prize snowboard won by Steve Ross of Quincy. Friends of Plumas Wilderness and its partner organizations encourage everyone to feel inspired and act on behalf of both local wild places and global climate issues. FPW hosts a variety of environment-themed events to highlight ways people of all ages and backgrounds can become effective agents of change to save their planet and the places they call home. 1) Find Your Biggest Lever — We all have a lever, we just need to use it. – Can you change things at your school or work? – Do you or your family own a business? – Do you have a social media following? – Are you a writer? Scientist? Artist? Speaker? 2) Get Active — Learn about the Plumas National Forest Winter Travel Management Plan. – Attend an OSV Open House or scheduled meeting with the Forest Supervisor, County Supervisors, or Congressional staff. – Vote for the environment. Check out LCV.org. 3) Educate Yourself — Knowledge is power. – Read “eaarth” by Bill McKibben. 4) Speak Up — Talk to your friends about climate change, biodiversity loss and the need to act now. – Write a letter to the editor or an op-ed to your local paper. – Contact your elected officials. – Join (or organize) a march.